Gastroscopy or upper endoscopy involves examination of the upper gastrointestinal tract, involving the oesophagus (food pipe), stomach and duodenum (first part of the small bowel).If you have symptoms or complaints of nausea, vomiting, heartburn, indigestion, black stools (melaena), weight loss, anaemia, abdominal pain, chest pain then upper endoscopy is considered. 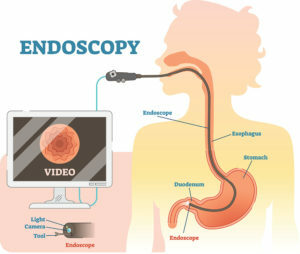 The procedure involves swallowing a thin, flexible tube called an endoscope. Right before the procedure you will receive a spray at the back of your throat with a local anaesthetic (numbing agent) that may help prevent gagging. A light short acting sedative is also offered to help you relax during the procedure. You are made to lie on your left hand side and a mouth guard is placed in your mouth which has an oxygen supply attached to it. Sometimes a soft sponge is placed in your nostril which provides oxygen, this should not cause you discomfort. A nurse will support your head and mouth. When the camera goes down into your food pipe and stomach you will be asked to concentrate on your breathing through your nose and mouth. The Surgeon is then able to carefully examine an image of the inside lining of the oesophagus, stomach, and duodenum by blowing air into the stomach. Samples of the internal lining can be taken by performing a biopsy to look for a cause of inflammation if noted and also to test for Helicobacter Pylori (a bacteria which if present can cause symptoms of indigestion and ulcer formation). If you have an ulcer this can be seen on gastroscopy and treated at the same time if any bleeding is apparent. The procedure can take no more than 3-5 minutes for the large majority of patients. After the procedure you are required to rest for up to two hours until the medication wears off after which you will be allowed a drink. You must not eat or drink anything for at least 6 hours before the procedure, as your stomach needs to be empty. The hospital will provide you with further instructions as to the time of your procedure and you must ensure that someone accompanies you to take you home afterwards, as you will not be allowed to drive because of the sedatives. Your surgeon may give you other special instructions. The procedure is generally very safe, there are always risks with the sedative given and the throat spray will not allow you to eat or drink for an hour after the procedure.